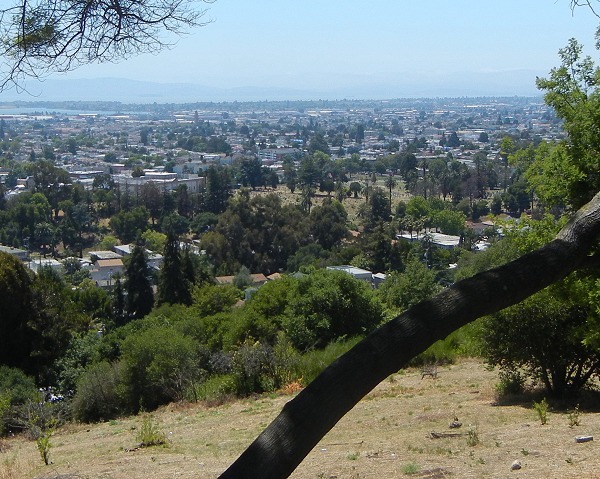 Cemeteries occupy some of Oakland’s nicest hillsides. 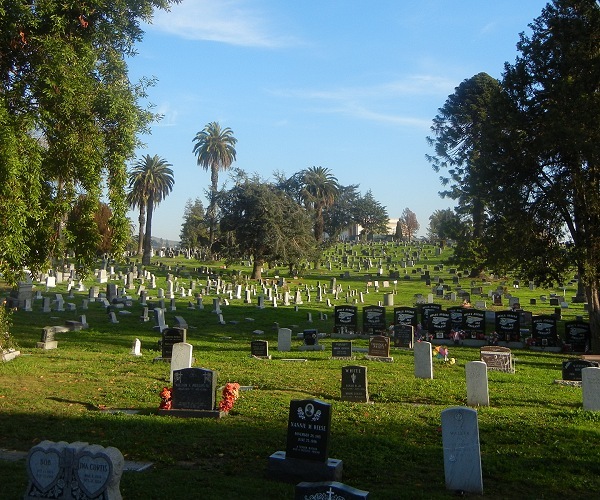 Evergreen Cemetery, unlike the others, has a whole hill to itself. The hill consists entirely of sand, silt and gravel laid down in a large alluvial fan (the Fan) back some time in the Pleistocene. Later, stream erosion cut the Fan into pieces, which I have numbered west to east from 1 to 8. This one’s the smallest and, all things considered, the sweetest. 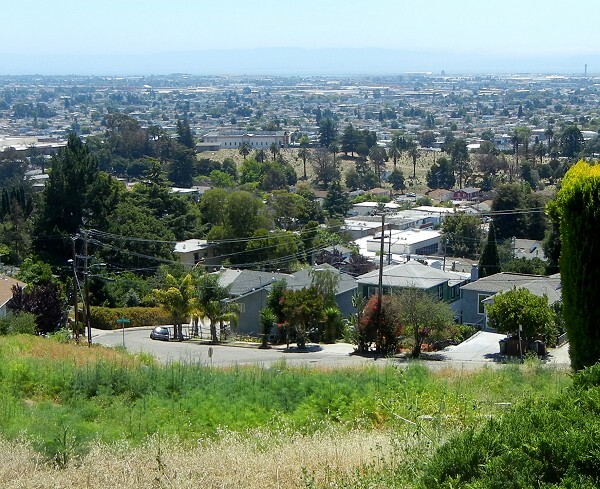 This is the view from 64th Avenue, the hill’s gently sloping side. The NL bus runs past here, too. Below is the terrain view in google Maps, where I’ve marked it along with lobes 6 and 7. 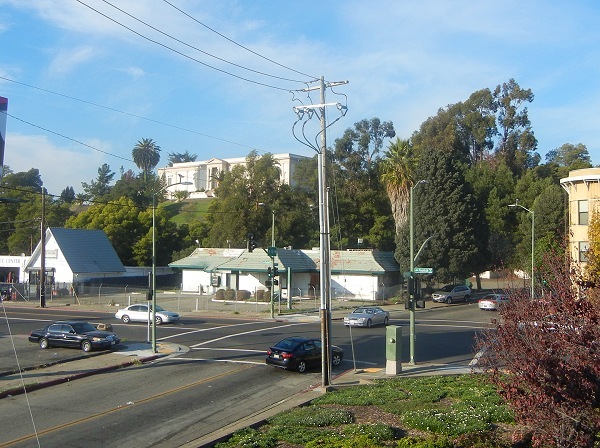 This is the view from across MacArthur Boulevard at 68th Avenue/Church Street. The hill is pretty secluded, with trees screening it on most sides. When you’re there, your eyes are lifted to distant views, which is fitting. The homes on the far side of 68th probably excavated into the edge of the hill when they were built. or from the overlook at the end of Simson Street. These days the cemetery is doing its part in the drought. Most homeowners are, too. The geologic map (as seen in this earlier post) shows a little more Fan alluvium to the north and east of the hill, but it’s topographically subdued. 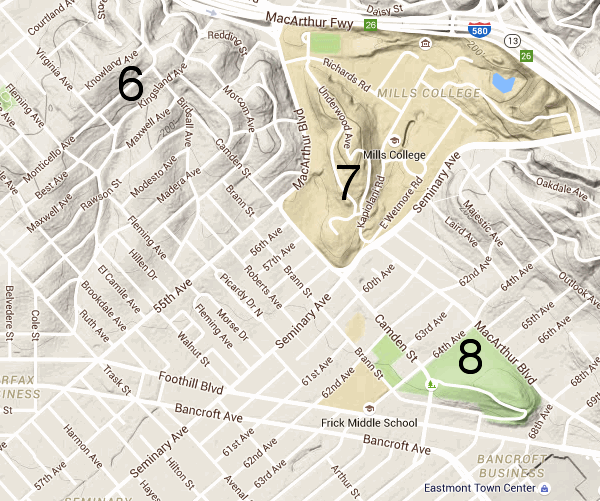 This entry was posted on 15 June 2015 at 8:03 am and is filed under Oakland geology views, the Fan. You can follow any responses to this entry through the RSS 2.0 feed. You can skip to the end and leave a response. Pinging is currently not allowed.